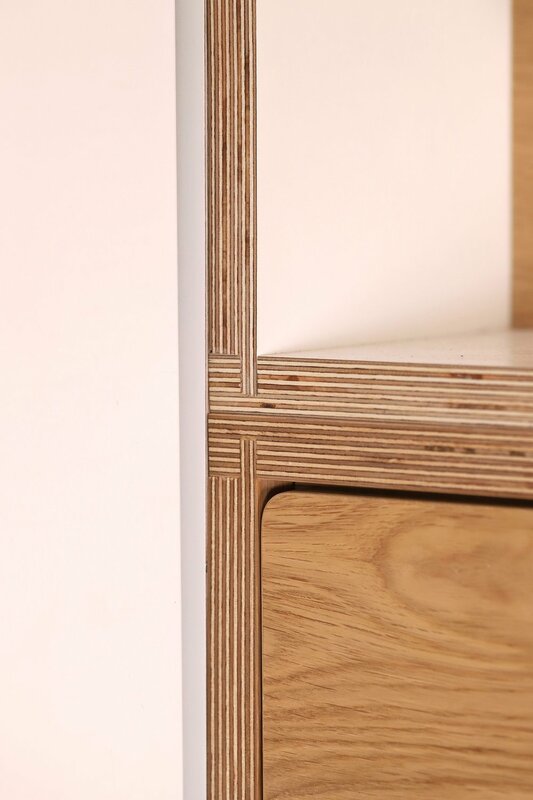 From clever ways to incorporate a home office into an unused space to large scale bespoke storage for a co-working space, Lozi can create a range of tailor made office storage solutions perfectly adapted to your needs. Book editor Ilaria needed plenty of storage space for her home office in East London. Her ample book collection needed its own space and she needed a quiet and peaceful place to work from, away from the busy distractions of family life. Lozi created this combination of bookshelves, cupboards, free-hanging desk and open plan shelving to suit her needs. Colourful highlights make the room child friendly for her two toddlers, and the space could ultimately be turned into a kids bedroom if needed. Ben wanted to create a home office within his living room without dominating the space, cutting off the room or stopping the light coming in from the large doors to the garden. Lozi created this neat and airy room divider that doubles as a workstation and a bookshelf from two L shaped storage systems. A compact desk peeks out form the wall on the right hand side whilst a large cupboard on the left allows Ben to hide away files and computer equipment. The symmetrical open plan birch plywood bookshelves clearly divide the room without blocking the view and the light from the garden. Slotted underneath the stairs, a very skinny folding desk allows this family to have a designated office space without having to dedicate an entire room to it. 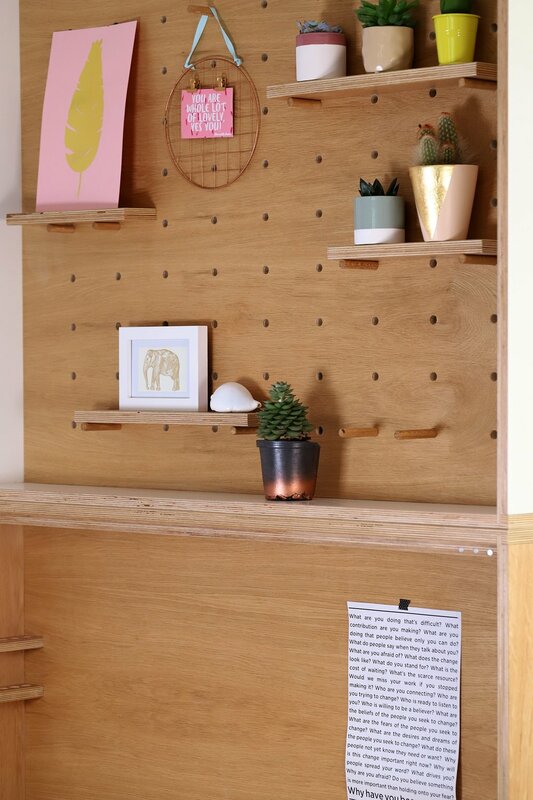 A modular board above can display small decorative items or to do lists and the designs folds out into a large desk area when needed. The whole design is a mere 15 cm deep, really making the most of this space. 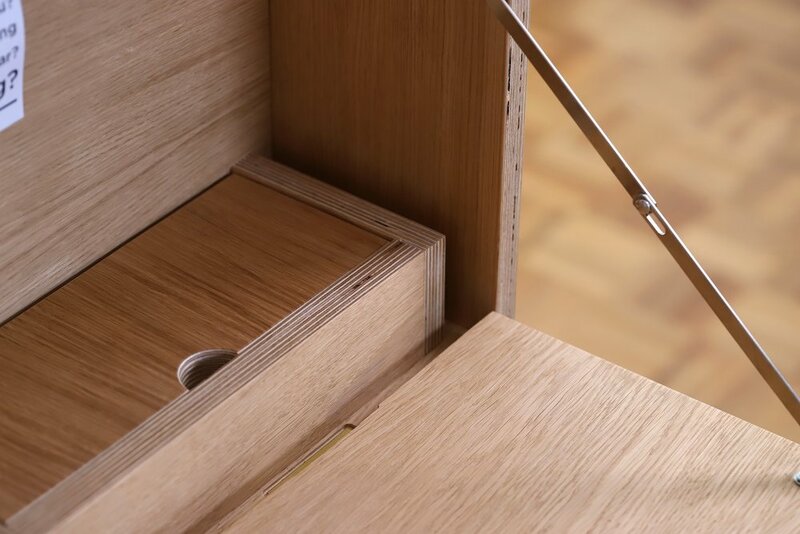 A cupboard underneath the desk is the exact depth for ring binders and other office equipment. A tidy desk is the path to a tidy mind. Must TNT seem to have taken this to heart, creating a practical but stylish office storage, easily accessible to all. 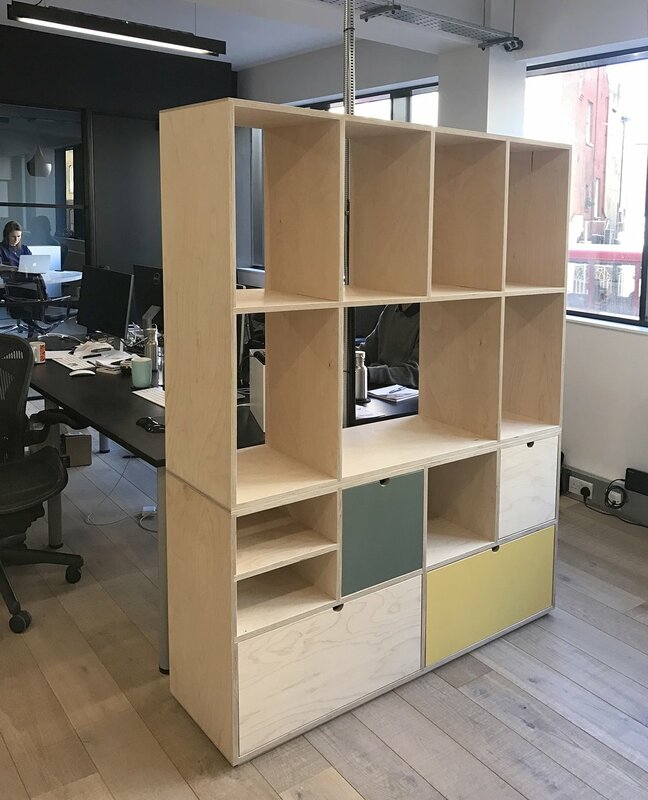 Three birch plywood storage systems provide a combination of open plan and boxed storage space whilst doubling as office dividers. Mismatched painted boxes bring a hint of colour to the space and prove that office storage doesn’t have to be boring.